In this week’s Investor Success Podcast, with special guest, Beau Eckstein, we talk about what it takes to flip million dollars homes. Ready to add a zero onto your flipping goals and go for the luxury market? You will want to take notes on how to do it! Beau Eckstein, Real Estate Entrepreneur, TV Personality, Private Money and Construction Financing Specialist and Investor. Beau has a diverse real estate background and has been in the real estate industry since 1999. This includes real estate sales, residential mortgage lending as well as commercial finance, construction financing and private money loans. Beau is an active investor and likes to partner with architects and builders. He works with buy and hold investors as well as fix n flips/rehabbers. 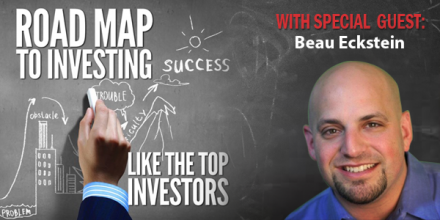 Beau has a team of professionals and has built a network over the years. His team members include architects, building designers, construction managers, contractors and many other professional partners. Currently Beau is the president of a Walnut Creek, CA real estate brokerage and marketing manager for a private money fund. He has several real estate investor club meetings. Beau filmed twelve episodes of “Flip It to Win It” for HGTV, the first episode airing March 4th, 2014. “Flip It to Win It” is a show that pits six teams of real estate investors against each other as they try to make the most profit by flipping foreclosed and distressed houses. The teams buy properties at auction, renovate the homes and sell them for a profit. When not involved in work related to real estate, Beau’s passion lies in social media and marketing, which he implements for his real estate businesses, along with help other business owners implement their real estate strategies.